The predominantly Queer San Diego Democratic Club heard from three local experts — San Diego County Democratic Party chair Jess Durfee, San Diego CityBeat editor David Rolland and political consultant Jennifer Tierney — on the aftermath of the June 8 primary election at their regular meeting June 24. The discussion centered mainly on how Democratic candidates like state gubernatorial nominee Jerry Brown and local City Council candidate Howard Wayne can overcome the vast advantage of Republican money — and, in Brown's case, the multi-billion dollar personal fortune of his opponent, Meg Whitman. The club also took a position against SB 1070, the controversial anti-immigrant law recently passed by the Arizona state legislature. 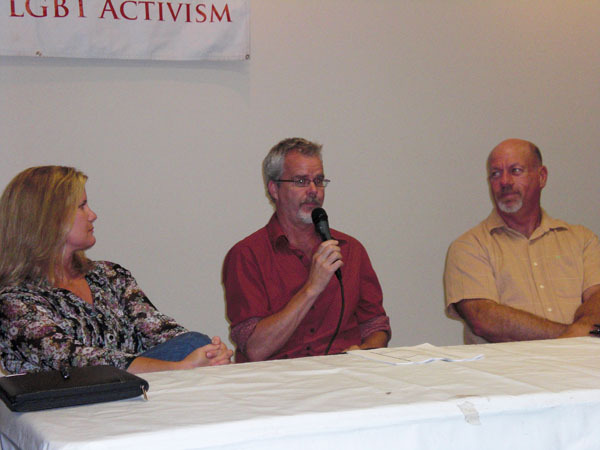 PHOTOS, top to bottom: Panelists Jennifer Tierney, David Rolland and Jess Durfee discuss the June 8 primary election results at the San Diego Democratic Club meeting June 24. 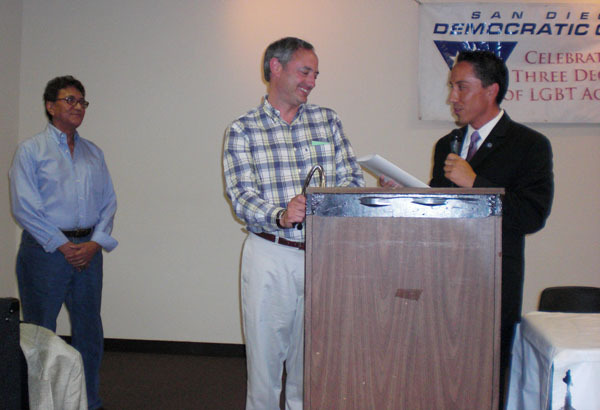 • Departing San Diego Democratic Club vice-president Alex Sachs (center) receives a proclamation from City Councilmember Todd Gloria (right) while club president Larry Baza (left) looks on. 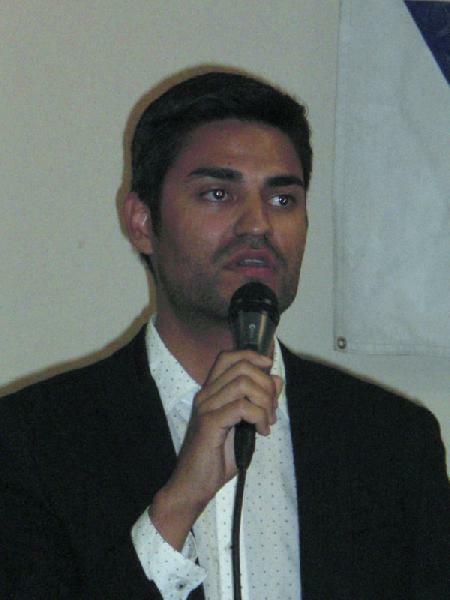 The predominantly Queer San Diego Democratic Club hosted a forum on the results of the June 8 California primary election at its regular meeting June 24. Pat Sherman, former editor of the Gay & Lesbian Times and current editor of the recently launched Gay San Diego, moderated the event and the speakers included San Diego County Democratic Party chair and former San Diego Democratic Club president Jess Durfee; San Diego CityBeat editor David Rolland; and political consultant Jennifer Tierney, who managed former Assemblymember Howard Wayne’s campaign for the District 6 seat on the San Diego City Council. Though most of the topics discussed were about the San Diego County results — Wayne’s second-place finish to Republican Lorie Zapf in District 6; the passage of Proposition D, making San Diego’s strong-mayor government permanent and adding a ninth City Council seat; and the imposition of term limits on the San Diego County Board of Supervisors — Sherman’s first question to the panelists was about what Democratic gubernatorial nominee Jerry Brown will have to do to overcome the enormous deep pockets of his Republican opponent, former eBay CEO Meg Whitman. “I prepared all my thoughts about local races!” Rolland joked in a tone of mock panic. Durfee questioned the assumption he thought Sherman had made in his question that Whitman and Republican U.S. Senate nominee Carly Fiorina will be able to run together as a team the way incumbent Senators Dianne Feinstein and Barbara Boxer were in 1992. Durfee said that Boxer, Fiorina’s opponent, “will take care” of her. “There’s certainly going to be an uphill battle to match the magnitude of money on the GOP side,” Durfee conceded, referring to the willingness of Whitman and Fiorina to spend millions of dollars of their own money to bankroll their campaigns. But he also argued that the spectacle of two standard-bearers essentially trying to buy public office with their personal fortunes might backfire against the Republicans in general. “I’m personally not in favor of term limits,” said Rolland. “They haven’t made the city of San Diego or the state of California better run, other than that there has been more representation of groups that have lacked representation in the past. There have been more women and ethnic minorities elected” due to term limits, Rolland said — and, he could have added, more Queers as well; openly Queer candidates were elected to the California state legislature and San Diego City Council only after term limits were imposed on those offices. But Rolland said that on balance he’s against term limits because “they limit your choice,” and as an example he said he’d like to have seen Donna Frye able to run for re-election to her District 6 seat on the San Diego City Council — especially since Right-wing Republican Lorie Zapf led the primary to replace her and, Rolland feels, has a good chance of winning the seat in the November election. Durfee said that the presence of a term-limits initiative on the June ballot helped the insurgent challenges that kept the two Supervisors up for re-election this year — Ron Roberts in District 4 and Bill Horn in District 5 — from winning the outright majorities that would have eliminated the need for them to face challengers in November runoffs. Though both Roberts and Horn came close to the 50 percent plus one needed for outright victory — Roberts got 47,.8 percent of the vote and Horn got 47.5 percent — “putting term limits on the ballot as a concept set the tone” that allowed a majority of voters in each district to consider alternatives to the incumbents. The first question from the audience was about Proposition D, which made San Diego’s strong-mayor form of government permanent and made the mayor’s power even stronger by adding a ninth City Council seat and increasing the threshold for sustaining a mayor’s veto of City Council legislation from five out of eight to six out of nine. The panelists assumed that the new Council seat will come from an increase in the number of Council districts from eight to nine in the next redistricting process after the 2010 census — even though some proponents of Proposition D were talking during the campaign about keeping the number of Council districts at eight and electing the ninth Councilmember citywide. “My position on strong-mayor is that it’s really executive-mayor, which is what we have at the federal and state levels and in most of our largest cities,” Rolland said. He mentioned the heat he took for CityBeat’s endorsement of Proposition D and said he couldn’t understand the “lot of hair-pulling” in San Diego’s progressive community over its passage. He pointed out that the federal and California constitutions both set the threshold for a legislative override of an executive veto at two-thirds, so he didn’t think that was such a big deal at the city. Durfee said that San Diego’s Democrats need to stop bitching about the power of the mayor and instead get behind an electable candidate so the strong mayor will be a Democrat. He pointed out that during the last City Council redistricting, “District 5 was already the largest and was projected to grow, and District 1 was the second largest,” so if the new Council seat comes mostly from those two districts it’s likely to be Republican — but the result will also make the current Districts 1 and 7 more Democratic, “so it’s somewhat of a trade-off.” He also said that the problem in creating an Asian-Pacific Islander district is those populations are not geographically concentrated in one area the way the city’s African-Americans and Latinos are. Asked by the club’s outgoing vice-president for political action, Alex Sachs, why Lorie Zapf was able to win the District 6 primary by 12 percentage points despite seemingly devastating reporting in CityBeat about her and her husband’s finances, including delinquent taxes and mortgage defaults, Rolland said, “We were flabbergasted that she beat Howard [Wayne] by 12 points. 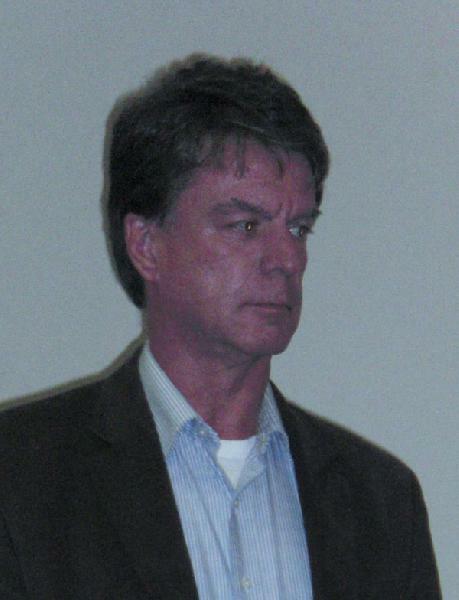 One of my reporters exposed Zapf as a religious zealot who doesn’t think Gay people are fit for public office and should not be close to any kind of decision-making.” He defended his paper’s stories about the personal finances of Zapf and her husband, saying they raised legitimate questions about whether she could deliver on her campaign promise to bring “sound financial management” to the city when she and her husband didn’t seem able to do that personally. “We reported that she and her husband were delinquent on their mortgage and three times delinquent on their taxes, while they were contributing to political campaigns,” Rolland recalled. Former club president Craig Roberts asked a follow-up question about lifting the money restrictions and whether that’s going to help Republicans long-term. “The window for unlimited contributions closed last week,” Tierney said. “You won’t see any more ,000 contributions to Zapf’s campaign. Now the limit is ,000 per person,” though she added that individuals and businesses can still give unlimited amounts to the Republican or Democratic parties for “member communications” — that is, mail pieces, e-mails and other targeted messages that go only to people registered with the party that’s sending them out. A surprise bit of business for the club at its June 24 meeting was a resolution, pushed by club president Larry Baza, to go on record opposing SB 1070, the law recently passed in Arizona requiring police officers with a “reasonable suspicion” that the person they have stopped for any reason is an undocumented immigrant to ask that person’s immigration status and arrest them if they cannot provide proof that they are U.S. citizens or legal residents. It also makes being an undocumented immigrant in Arizona a state, as well as a federal, crime. Though the law contains a pro forma statement that police are not supposed to use it as an excuse to do racial profiling against Latinos, the law’s opponents, both inside and outside Arizona, argue that in practice Latinos will face police harassment, and possibly even wrongful deportation, because of it. The resolution as drafted urged local governments in San Diego County to pass their own resolutions opposing SB 1070, “call[ed] on the entire LGBT community to stand with the Latino and progressive communities” against the bill, endorsed the demand for so-called “comprehensive immigration reform” including the Uniting American Families Act (a bill that would allow U.S. citizens in bi-national relationships with foreigners of the same gender to sponsor their partners for immigration the way U.S. citizens in opposite-gender marriages with foreigners can now) and supported the call for a boycott of Arizona until the law is repealed. The boycott call was the one controversial part of the resolution. Club member and union staffer Brian Polejes asked if immigration rights activists in Arizona supported boycotting their own state the way Black civil-rights activists in apartheid-era South Africa had supported the international boycott of their country. Former club president Andrea Villa said she didn’t know, but that some members of the Arizona state legislature who had opposed SB 1070 had joined the call for a boycott of Arizona. Eventually, with one minor change — adding a clause urging the California state legislature not to pass a similar bill — the resolution to oppose SB 1070 passed with just one vote in opposition. The meeting also heard from Carlos Marquez, political action coordinator of the Lesbian, Gay, Bisexual, Transgender Community Center, on plans for rallies on the so-called “Day of Decision” when federal judge Vaughan Walker issues his decision on the constitutionality of Proposition 8; and Paul Clay, candidate for State Senate in the 36th District against Republican Joel Anderson, who said he thinks he stands a good chance of winning because many Republican voters dislike Anderson enough to cross over. The club voted to endorse three Democratic nominees for statewide office, one — Attorney General candidate Kamala Harris — in an office they hadn’t endorsed in for the June 8 primary, and two others — Lieutenant Governor candidate Gavin Newsom and Insurance Commissioner candidate Dave Jones — for whom they’d endorsed their primary opponents. The club also heard a presentation from San Diego State University professor Marti Hatrack about AB 2072, a bill currently before the California State Senate that would affect the options made available to parents of deaf newborns about the communication options available to them. Hatrack, speaking in American Sign Language (ASL) with a volunteer interpreter translating for the audience, explained that the deaf community had opposed this bill largely because it promotes the interests of audiologists and hearing-aid manufacturers rather than the deaf community. What specifically upset her was that in the eight-page brochure that would be given to parents of deaf newborns under the bill, the emphasis was on teaching deaf children verbal English rather than ASL. “We’re promoting ASL and English in a bilingual approach,” she said.